Dan Cereill feels like his life is falling apart. His dad left, his mum has no money and her new business is failing, they move house, Dan starts a new school and gets a job that doesn’t pay anything. To make it all so much worse, he has fallen for Estelle, the girl next door - literally - who doesn’t know he exists. A likeable teenager, Dan has struck a rather large run of bad luck. He discovers a secret opening between his and Estelle’s attics and he is soon breaking all the rules by reading her diary and finding out all that he can about her. This information is useful as he slowly gets to know her, but it is also his potential downfall, not that he needed much help in that area. Dan is ordered by one his teachers to help organise the school social and Dan is thrown into this along with Estelle and school bully, Jayzo. Dan’s growing popularity is destroyed when he accidentally injures the hand of the school band’s guitarist and the band is no longer able to play at the social. Dan has less than 24 hours to come up with an alternative. 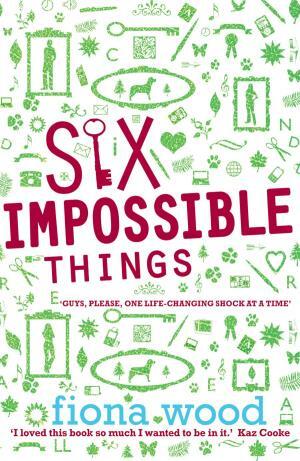 Six Impossible Things is an enjoyable story and delves into the complexities of teenage relationships with their friends and families. Jealousy, self-confidence, disobeying parents, bullying and loyalty to friends are all explored in Fiona Wood’s debut novel. The biggest challenge that Dan faces is his relationship with his father. Throughout the novel Dan is torn between wanting things to be the way they were and trying to deal with his father being gay. Six Impossible Things resolves most issues, but not all. This is a good thing for the reader as it leaves them thinking and wondering, just like in real life. Six Impossible Things is recommended for 13+.